This photo was a long time in the making. Like a true pottery nerd, I spent two separate weeks of June 2011 on a pottery pilgrimage. I was hunting for inspiration, both for what to make in the studio, and for what to do with my life after my apprenticeship. Equipped with a hungry curiosity, Mary the Madza and a GPS, I found a few answers, at least. Early in June, while re-connecting with friends from Holden in Minneapolis/St Paul, I made a venture into the St Croix River Valley. Warren Mackenzie gave the Minnesota potters a lovely tradition of trusting their galleries and studios to the general public, allowing any and all curious people to poke about unattended. In just such a fashion, I explored the studios of and bought pots from Bob Briscoe, Jeff Oestreich, and Will Sawnson. What a fertile pottery neighborhood! I was amazed at the variety of forms I saw, and took many pictures and notes in my sketchbook. I did my best to soak it all in, but with the capstone of a visit to the Northern Clay Center in Minneapolis, it was just an embarrassment of riches. While at the center, I was able to hold and tactily explore the work of even more inspiring potters. What a glorious opportunity! However, the highlight of my Minnesota trip was definitely the lunch I shared with Linda Christianson. My friends from DC, Laura and John, met up with me at Linda’s lovely studio in the woods during their own pottery pilgrimage to the area. After a thorough tour of Linda’s beautifully-designed bourry box kiln and brand-spanking new studio, we all settled into Linda’s kitchen for a snacking and chatting-filled lunch. Her kitchen was a beautiful assortment of well-used and well-loved pots, where one could easily lose and afternoon exploring and inquiring about each one. Here was fine art pottery in action. We spoke of soft mug handles, of sharp cheeses, of the smell of kilns in reduction and the aroma of baking pears. Upon leaving, I purchased a lovely little baker that caught my attention. I packed it away and didn’t think much about it until weeks later, once home in Virginia. Later in June, the whole Tye River gang (besides Kevin himself) took a tour through Seagrove, North Carolina. The pottery heartland! 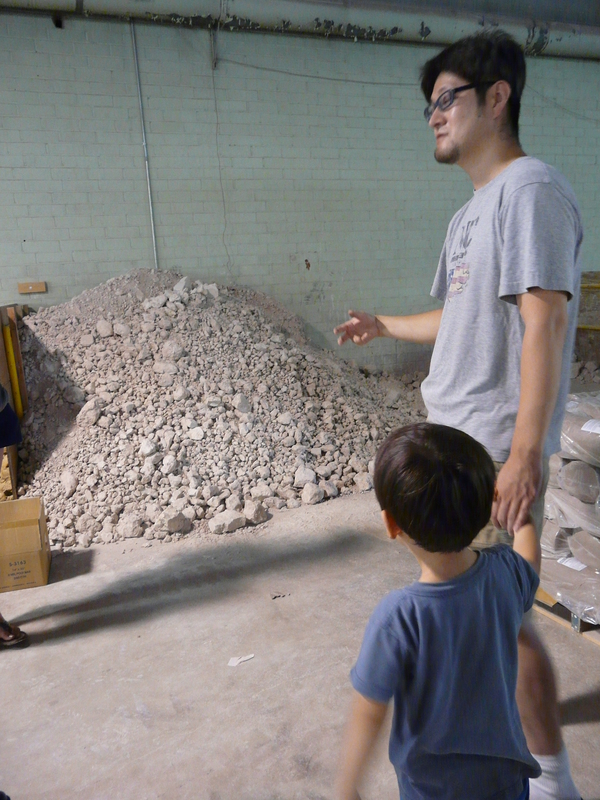 We started at Starworks Clay Studio, where Takuro Shibata and the knowledgeable Ken gave us a tour of the clay factory, the artists studios and classrooms, and the sweet little wood kiln they have there. From there, we forged on to the studios of Daniel Johnston, Donna Craven, Jeff Dean and Stephanie Martin, David Stuempfle, and the Owens family. Each pottery had a different kind of kiln, a distinct style, and the technical skills to make the kind of work they wanted to. That is the quality of knowledge I aspire to; the knowledge and ability to make confident decisions to achieve your specific aesthetic aims. WHEW. That was a mouthful. What I mean is, I admired each of their setups immensely, and could see myself walking down similar paths. We concluded the trip to Seagrove with a visit to the home of Dwight Holland, a notoriously friendly pottery collector in the area. He let us explore his home, which was stuffed TO THE GILLS with functional pots from all our favorite potters, as well as many we had yet to fall in love with. A kitchen jungle of mugs, an entire room devoted to teapots, a wall-gallery of 24-inch platters climbing as high as the ceiling. Every surface of Dwight’s house is a treasure trove of beautiful and inspiring ceramic work. Earlier in the day, Daniel Johnston had given us advice as young potters in the field, “limit your influences,” he’d instructed. I had scoffed initially to that comment, being a pottery blog addict myself. 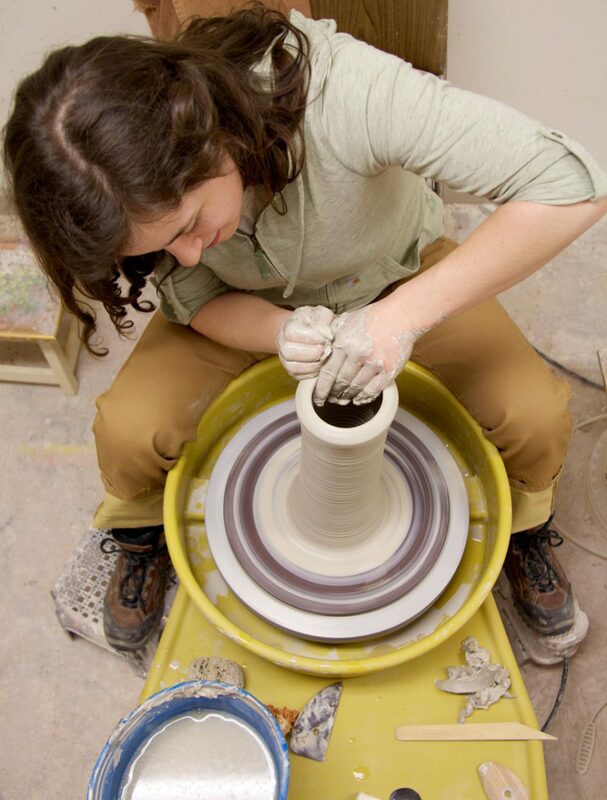 The internet is an amazing resource for potters to connect, market their work, and get inspired. But too much inspiration can be more confounding than none at all. My summer was just that, confounding. So many paths to take, so many pots to make! Pottery is a field with such longevity that you can be sure everything has been done before. I know that trusting your instincts and following your whimsy is the only way to make genuinely inspired work. In looking back upon my summer pilgrimage, it seems like a blur. But one moment seemed to stretch out, to slow time down for a few hours – my afternoon in the kitchen with Linda Christianson. I tried to take Daniel’s advice to heart, to hone in on what it was about that experience that was so nurturing. Then it clicked. Linda’s kitchen was the only place where I actually USED the beautiful work I was seeing. And by using the pots, by eating and drinking off them, by pouring and serving from them, it felt like we were honoring them. We were completing the process. I pulled the baker out of my living room, and put it in the kitchen where it belonged. 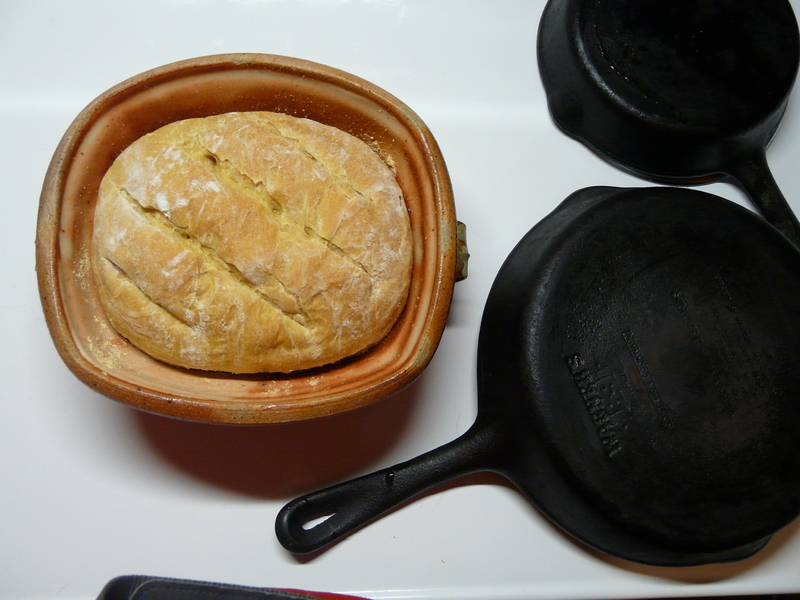 I let that little baker inspire what I would cook for dinner that night, and then used it to bake bread the next day. It inspired me to make countless cobblers in it throughout the rest of the summer, and corn puddings in the fall. There was eggplant parmesean, enchilada pie, and quinoa casserole. Most importantly, it inspired me to make bakers myself. Since then, I have let my time in the kitchen inspire and inform my work. I’ve been making bakers, honey pots, and mixing bowls. I’ve been using them, as well, and refining the design to function as seamlessly at possible. What kind of food would look beautiful in this pot? What kind of pot would serve this food best? I’ve been trying to go on the internet less, and go into my kitchen more. The flax-seed sourdough loaf at the top of this post is in one of my own bakers, but it shared the oven rack with the baker of Linda’s which lured me down this path initially. That’s pottery loyalty.